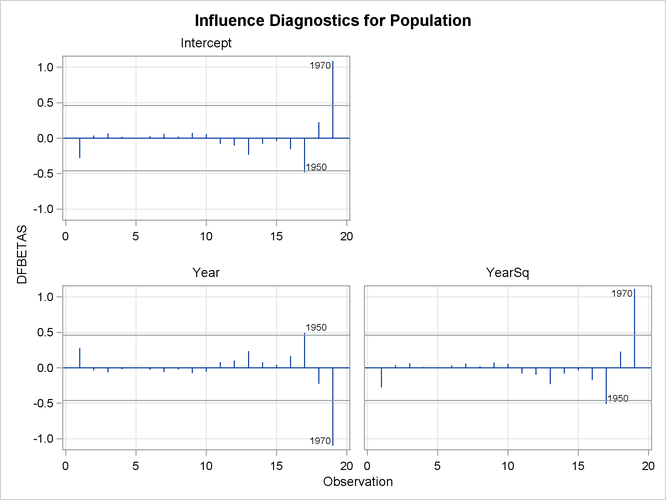 The following statements use a subset of the data in the population example in the section Polynomial Regression. The INFLUENCE option produces the tables shown in Figure 85.38 and Figure 85.39. 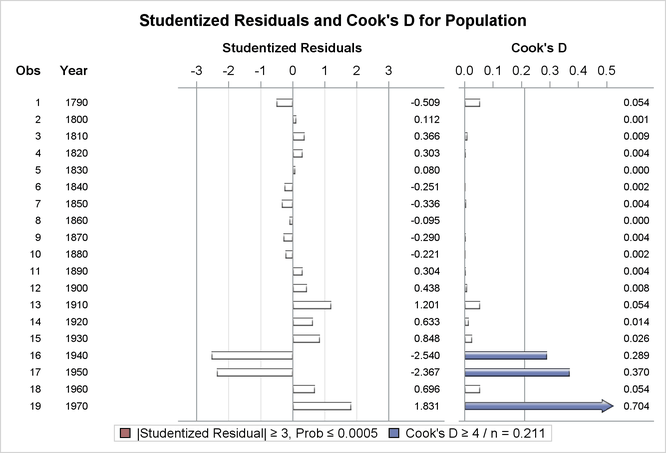 In Figure 85.38, observations 16, 17, and 19 exceed or are near the cutoff value of 2 for RSTUDENT. None of the observations exceeds the general cutoff of 2 for DFFITS or the DFBETAS, but observations 16, 17, and 19 exceed at least one of the size-adjusted cutoffs for these statistics. 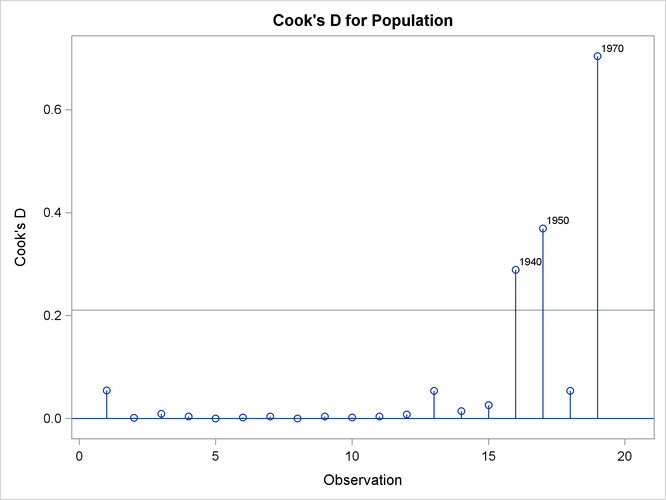 Observations 1 and 19 exceed the cutoff for the hat diagonals, and observations 1, 2, 16, 17, and 18 exceed the cutoffs for COVRATIO. Taken together, these statistics indicate that you should look first at observations 16, 17, and 19 and then perhaps investigate the other observations that exceeded a cutoff. 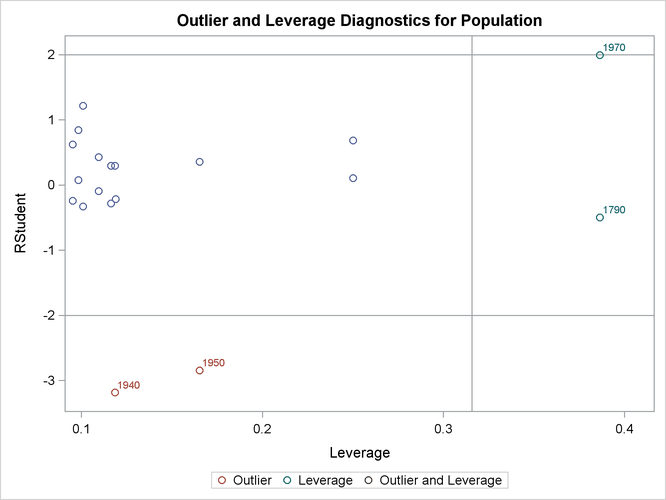 The LABEL suboption specified in the PLOTS(LABEL)= option requests that observations that exceed the relevant cutoffs for the statistics being plotted are labeled. Since Year has been named in an ID statement, the value of Year is used for the labels. The requested plots are shown in Figure 85.40. The chart is shown in Figure 85.41. 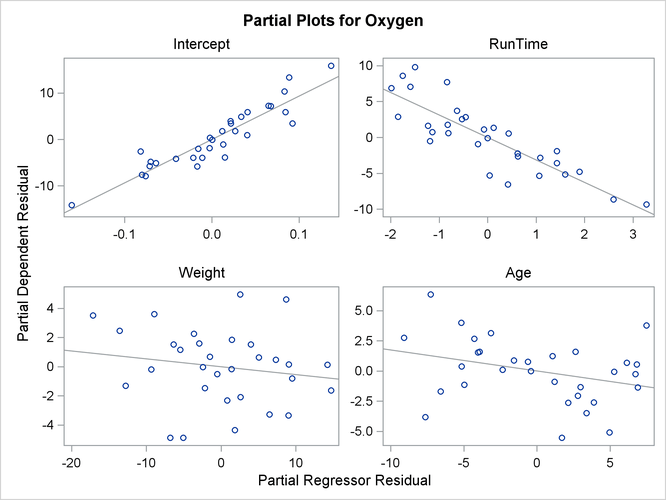 The following statements use the fitness data in Example 85.2 with the PARTIAL option and ODS Graphics to produce the partial regression leverage plots. 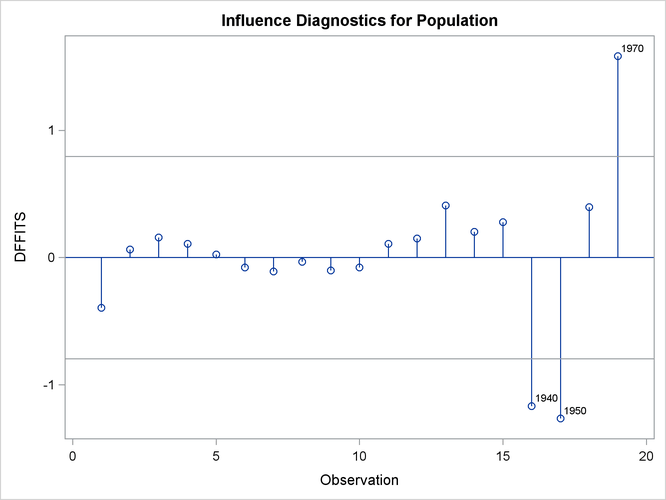 The plots are shown in Figure 85.42.